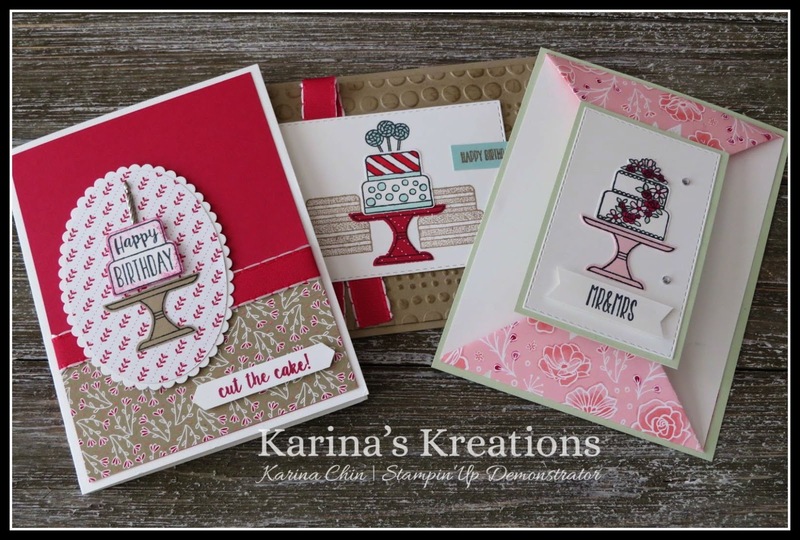 Karina's Kreations: Piece of Cake Class to go! Piece of Cake Class to go! I am offering a class in the mail. This month the class is designed around the Piece of Cake stamp set and Cake Builder punch. + Your choice of Sale-a-bration item. + Video showing how to assemble your cards. You will need a Black Memento ink pad, Crumb Cake ink pad, a Real Red, crumb Cake and Pool Party Stampin' Blend or Stampin' Write maker, adhesive and a clear block to complete your class. Please email me at kchin2@telus.net to order your kit.